Manually offload selected backup files to object storage repositories. Consider that backup files you want to offload must belong to an inactive backup chain. For more information, see Backup Chain Legitimacy. Remove blocks of data that were copied, as described in Copying to Performance Tier. Mind that such copied blocks will only be removed from the extents, not from object storage. In the working area, right-click a backup job and select Properties. Belongs to an inactive backup chain. When moving such a backup, Veeam initiates a new session of the SOBR Offload job. For more information. see SOBR Offload Job. Was replenished by copying offloaded data from object storage. For more information, see SOBR Download Job. 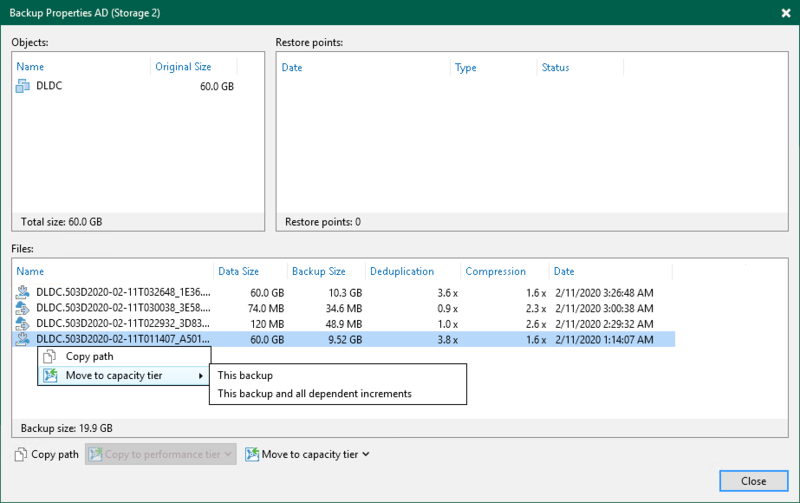 When moving such a backup, Veeam simple removes all the copied blocks of data from the selected backup file, leaving it only with metadata. Nothing is going to be offloaded in such a scenario. This backup and all dependent increments — to offload the selected backup along with its associated increments or to remove all the copied blocks of data from the selected backup and its associated increments. This backup — to offload a full backup only or to remove all the copied blocks of data from such a full backup.